Dr Chris Ritchie and colleagues have published a paper on a new class of self-assembled molecules for advanced materials. Addressable, self-assembled molecules with predictable compositions and structures will be important components of advanced functional materials for the foreseeable future. In this research article (Xu J., Volfova H., Mulder R. J., Goerigk L., Bryant G., Riedle E., Ritchie C., J. Am. Chem. Soc. 2018, doi: 10.1021/jacs.8b04900) we discuss the design, preparation, and properties of the first reported example of a photo-switchable polyoxometalate diarylethene coordination complex. 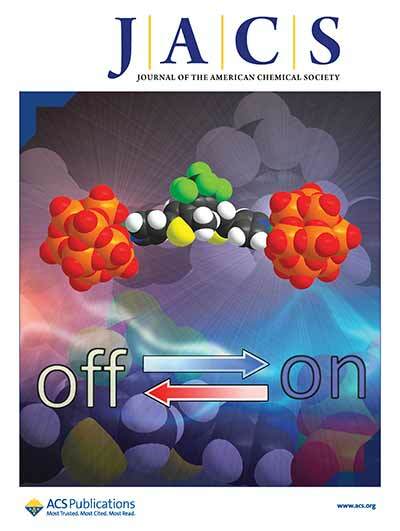 As anticipated, the reaction components self-organize to yield a molecular “dumb-bell” that is constrained by steric and electrostatic factors, effectively “locking” the photo-responsive ligand in its photoactive conformation. Unlike the non-coordinated ligand, the electrocyclization reaction of the resulting assembly can be triggered using visible light, converting the substance from pale green to an intense blue colour via a polyoxometalate based excitation pathway. This work, conducted in collaboration with colleagues from the University of Melbourne, RMIT, CSIRO and Ludwig-Maximilians-Universität unveils the potential of such molecules as components in next-generation photochromic materials. Continuation of this successful collaborative research programme will be led from Monash University as part of an ARC Future Fellowship awarded to Dr Chris Ritchie.